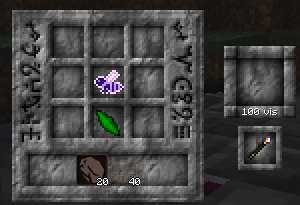 ThaumicBees adds several new bee species to Forestry that will assist in producing useful items for Thaumcraft. If you love Thaumcraft and Beekeeping, these new species will provide extra resources and benefits to those clever enough to obtain them. Keep in mind that both these mods require Forge as well! ThaumicBees should work with a version required by either Forestry or Thaumcraft. Installation is easy! Just drop into your mods folder next to Forestry and Thaumcraft! These versions will not work with Forestry 1.6.4.2! 14 new bee species! Can you breed 'em all? Added another Swarmer inducer item - craftable via carpenter using liquid honey, Royal Jelly, Pollen and Enchanting Drops from Arcane bees. 8 times more effective than Royal Jelly alone! Added carpenter recipe for candles using magic wax. Same patterns as with beeswax. Extra alles for bee mutations! Thaumcraft aspects associated with some Forestry items! Two bee lines create the foundation of ThaumicBees - The Supernatural and Arcane branch. It is said that only one who is both brave and refined may enter the world of the Supernatural, while the Arcane power of magic has both a devilish, yet commanding quality to it. Neither branch is particularly easy to advance, and you may find yourself exhausting your courage as you travel to the ends of the world to find mates that will propel your bees farther into the world of Magic. In addition to the new bee species, ThaumicBees adds some special resources that may help you with your Thaumaturgy. Centrifuged combs may produce magical wax that you can use to craft more Essentia bottles, or use in your cauldron for their aspects. The final 4 species of bees are only obtainable via the Thaumcraft Infusion Altar, provided you can breed a bee that unites both the arcane and supernatural aspects of Magic. If you encounter an issue while running ThaumicBees, check the crash logs to see if it is actually ThaumicBees's fault it went wrong, and not Forestry, Thaumcraft, or some other mod you have installed. (Note: If you see any "allele not found" messages in the log, that's probably my fault.) If you still figure it's ThaumicBees, post here with crashlogs and a brief description of what you were doing at the time. I am open to adding new features to ThaumicBees, and have several items on my to-do list, including crating of TC items, a new bee housing contraption, and future bee lines with interesting and "interesting" properties. This mod uses the Forestry API and Thaumcraft API with permission. Code and sprites not part of Thaumcraft or Forestry is © MysteriousAges 2012. Man... there goes my free time. Really cool. Is there any worldgen associated with this? Just posting so that I can find this thread later. Looking forward to giving a try tomorrow. I'd best get a few apiaries going in my FTB MindCrack world. No worldgen. 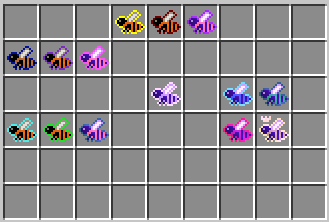 Bees are obtained with regular breeding mechanics and some Thaumcraft resources. Sounds great. I'm looking forward to giving it a try tomorrow Really late! Well done! Ooh, I like it. However, in my TC3 world, I don't have forestry and don't plan to install it ever, as the only aspects I enjoy and think fit in with Thaumcraft are the bees. I might suggest that you expand this so that it doesn't require forestry in some way. You could create your own kind of apiary/alveary using greatwood or other aspects, and so make it not dependent on Forestry, but make it compatible with Forestry. Anyway, I don't really mind, but I WOULD DEFINITELY use this mod if you made it separate from Forestry, but otherwise, you simply have my support, whatever that's worth. Anyway, nice work on the mod! This seems very nice! I am glad something like this came out. Mind posting your Thaumcraft config? It looks like it had some trouble determining the block ID of the Silverleaf/Cinderpearl plants. Since I'm getting the exact same error..
# Enables a version of the Thauminomicon in creative mode that grants you all the research when you first use it. # Allow warded stone to be crafted and placed in the world. # Item aspects are hidden by default and pressing shift reveals them. Changing this setting to 'true' will reverse this behaviour and always display aspects unless shift is pressed. # If set to true golems will attempt to play the chest opening animations and sounds whenever they interact with them. # This is a comma-delimited list of any block-id's the portable hole is not allowed to pass through. # Various research related things. # If a chunk is encountered that skipped TC worldgen, then the game will attempt to regenerate certain world features if they are set to true. CAUTION: Best used for worlds created before you added this mod, and only if you know what you are doing. Backups are advised. # This key is used to keep track of which chunk have been generated/regenerated. Changing it will cause the regeneration code to run again, so only change it if you want it to happen. Useful to regen only one world feature at a time. I should be able to grab the block IDs out of that config. Happen to have a list of mods you were running? Clay Soldiers, Thaumcraft, Buildcraft*, Forestry, Limber, Necromancy, Little Maids, Middle Age*. *Installed after errors with This mod made me temporarily uninstall it. Probably this mod is bugged, isn't incompatibile with other mods. On clean Minecraft with Forge, Optifine, Forestry, Buildcraft and Thaumcraft this mod has crashed. What versions are you running of each? Whatever the latest versions of them are. I had it crash on me before because my launcher file was on my desktop. I placed it in the minecraft folder and it worked fine. The reason I think is because this mod modifies the thaumcraft config file and if the launcher is in the wrong place it puts the config wherever the launcher is. Moving it fixed the crash for me. Aha, I know what's going on. Will attempt a fix shortly! Made a new version to use absolute configs paths. If you were getting an error around FlowerProviderThaumcraftFlower, grab the new version from the OP and try it out. Sorry for the inconvenience.